Simo, remember to look in your mirror. Yes, you drive forward, but on local streets you are really driving your tandems, 60 feet behind you. In fact, on corners and other sharp turns, you need to look in your mirrors more than you look ahead! Practice this: at home, get the broom or a kitchen mop. Hold the top end of the handle next to your waist, let the broom/ mop end drag behind. Now, walk around the house, but don't hit or scrape anything with the broom or its handle! Yes, you will be thinking about what's behind you more than what's on front. Pay attention to where you walk - big wide turns around the table, careful not to walk into the wall when you turn down the hallway. Walk like that as much as you can before Monday. It will put you on the best frame of mind for driving a truck. I would make a list 9f the things I need to learn and work on them wo th the new trainer. If you are trying to avoid cars.... are you driving too fast? Too closely? Are you not looking in your mirrors to predict upcoming hazards? I am really happy to hear that. I agree with your positive outlook on it. Good luck. It my fault cause i avoid a cars but no one can believe me cause i dont have camera in my dash. It was my week solo after i got out from trainer truck. I hit tree and i nock traffic light . Avoiding cars is not a valid reason to hit another object in most circumstances. Especially since trees and traffic light poles are not in the roadway, which means your truck left the road. Two preventable accidents in the same day is going to look pretty bad to most companies, rookie or not. Since you didn't receive a ticket for either accident you probably have a better chance. Still, in this case I think you'd be best off trying to remain at your current company. You said they pulled you from the truck and you're waiting on an answer on whether you're still employed or not. My advice is to humble yourself. Admit your mistakes, don't make excuses, and beg for a second chance. Offer to go back out for training. Do whatever it takes to remain employed there. Short of that, apply anywhere and everywhere you can. No damage to the tree Trailer get damage little bit in top. The traffic light got damage it need to be replace. I was avoiding cars!! Yes, Simo, avoiding cars is important. But you also need to avoid everything else. Since you're new solo, even with the damage you have, your company might keep you, after a very serious talk. Maybe some extra practice with another instructor. What were you doing when you hit these things? Was there any damage to either your truck or the light and tree? It would be nice if you would present the information publicly so others can learn from it. Scooter- I am currently going through orientation with Melton and while I cannot really answer to the specifics of your questions I can say that they are a great company and very honest about everything. Now I do know that he can use his GI bill here as OTJ training for up to 1 year. I just filled out the paperwork for that today. So that'll be a bit of extra cash in my pocket every month. If he has to come to Tulsa for orientation a couple of the instructors here are Vets and all of them are pretty good guys. The orientation is really good and they get into stuff that most companies never talk about. 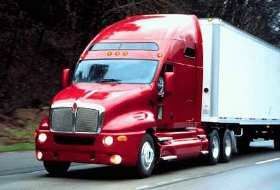 Like today we had a class on the realities of trucking and the family issues that can come with it. They talked about things the driver really needs to consider as far as making sure things go as smoothly as possible. I'm sure being an Army wife you guys have been through some of those sort of lectures. Most of what we work on is trip planing, load securement and tarping. You'll hear a very few folks here and there complain about it being so easy to be kicked out of orientation. We started with 23 and are down to 17 today. A couple left because they realized flatbedding just wasn't for them. The rest were sent home for completely legitimate reasons. The ones they sent home they even gave a bus ticket. Simo, Welcome to the forum! Is this your first trucking job? If so, you've made an excellent choice as a starting point for a flat-bed driving position. I hear a lot of good things from our members who have gone through Melton's orientation and new driver training. There's no reason for them to send you home unless you have your own issues. If you can pass a drug test and physical, and demonstrate a good strong work ethic while getting along with the others there you will be just fine. The reason you hear about people getting sent home is that most people trying to get started in this are totally unprepared for what they are getting into. It's always tough at the beginning, so just hang on and expect a tough ride at first. After a few months it will get easier. Here's some valuable resources for you to check out.